Attorney General Jeff Sessions on Saturday released a statement thanking the FBI and Pittsburgh police for their response to Saturday's shooting at a synagogue in Pittsburgh. "Hatred and violence on the basis of religion can have no place in our society," Sessions said. "Every American has the right to attend their house of worship in safety. Today 11 innocent people were suddenly and viciously murdered during religious services and several law enforcement officers were shot. These alleged crimes are reprehensible and utterly repugnant to the values of this nation." He went on to say the Department of Justice will file hate crimes and other criminal charges against Robert Bowers, the defendant, including charges that could potentially lead to the death penalty. "It has been an important week for us to show gratitude for the hard work of our law officers around the country," Sessions said. "And today was no exception. I want to thank the FBI, ATF, Pittsburgh police, and especially the heroic officers who were so quick to respond to the shooting, including the multiple officers who were shot. These officers ran to danger to save others, which reflects the highest traditions of policing in this country. There can be no doubt that they saved lives today." 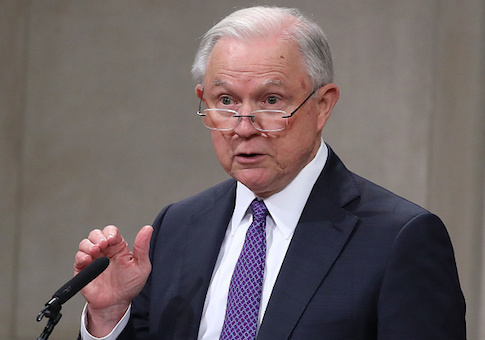 "The Department of Justice will continue to support our state and local partners and we will continue to bring the full force of the law against anyone who would violate the civil rights of the American people," Sessions continued. Bowers surrendered to authorities Saturday after he went on a shooting rampage at the Tree of Life synagogue, where he killed 11 people and injured several others. He made anti-semitic statements during the shooting and targeted Jews on social media, according to a federal law enforcement official. This entry was posted in National Security and tagged FBI, Jeff Sessions, Pennsylvania, Police. Bookmark the permalink.